When the Caller ID feature is enabled on your iPhone, you will be able see the Phone Number and the Name of the person that is trying to Call your iPhone. Similarly, when you call other people, they too will be able to see your Phone Number and Name displayed on the screen of their Phone. 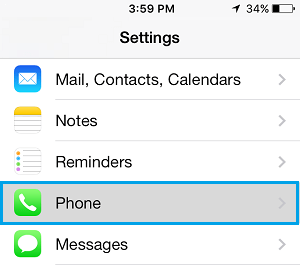 However, due to various reasons, you may be forced to think in terms of disabling or Hiding your Caller ID on iPhone. If this is the case, you will find below the steps to Hide Caller ID on iPhone, both at global level and also on Per-Contact or Per-Call basis. Follow the steps below to Hide your Caller ID at a global level. This means that your Phone Number or Caller ID will be blocked on all Calls made from your iPhone. 3. On the next screen, tap on Show My Caller ID. 4. On Show My Caller ID screen, disable the option for Show My Caller ID by moving the toggle for Show My Caller ID to OFF position. As simple as that, from now on your phone number will never be displayed whenever you make a Call to anyone using your iPhone. In case you want to, you can enable Caller ID back on your iPhone at anytime by toggling back the option to ON position. Note: Caller ID blocking is not allowed in some countries or by some carriers. In such cases you may find the Caller ID option grayed out. Instead of Hiding Caller ID at a Global level, you can Hide Caller ID on Contact Basis. You may have your own reasons for Hiding Caller ID from this Contact of yours. For example you may be trying to find out whether or not this Contact has blocked your number on iPhone, by making a call with your Caller ID hidden. Blocking Caller ID on a per Contact basis takes a bit of effort but it is not that hard, as you can see from the following steps to Hide Caller ID from a specific Contact on your iPhone. 1. First, you need to find out the Code for disabling Caller ID in your area. Generally, the code for disabling Caller ID in North America is *67 and #31#. The Code *67 also works for landlines, while the code #31# works for many cell phones in North America, Australia and Europe. Code 141 works for United Kingdom and Ireland, while code 1831 is known to work in Australia. You can find out the codes for other regions by visiting this article on Wikipedia. Note: Some Cell Phone providers may provide their own codes for blocking Caller-ID and may also charge for this service. You need to contact your service provider in case above codes do not work. 2. Once you are ready with the Code, tap on the Phone App on your iPhone. 3. Next, find the Contact for which you want to disable Caller ID. 4. Once the Contacts page, tap on the Edit located at the top right corner of your screen (See image below). 5. 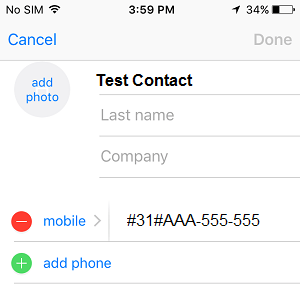 On the Contacts screen, modify the Contacts Phone number by adding the Caller ID blocking code to the phone number of the Contact. For example let us say that your Contacts phone number is AAA-555-5555, you will modify the number to #31# AAA-555-5555 (See image below). Now every time you make Call to this Contact of yours, the Phone Number will be dialed with the Caller ID Blocking Code. 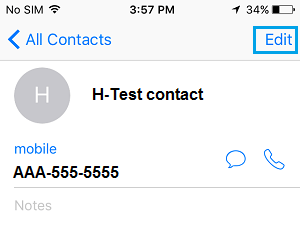 This will prevent your Phone Number being displayed on your Contact’s phone. Note: Caller ID blocking by using *67 or #31# may not be allowed by some service providers. They may have their own special codes or may require you to block Caller ID by accessing their website. Also, some service providers may require you to dial the *67 or #31# code first and then wait for the regular dial tone to return before dialing the 10-digit number that you wish to call. As you can imagine, above steps will not work in such cases. Hide Caller ID on Per Call Basis. In this case you are trying to block or hide your Caller ID during an occasional call to a person who is not on your contact list. A good example of this would be for making a call to an anonymous caller who might be annoying you by text and voice messages. The procedure to hide Caller ID during an occasional call is similar to disabling Caller ID for an individual contact on your iPhone. In this case, you will be dialing the number directly, instead of modifying the phone number on your contact list. 1. Find out the Temporary Caller ID disabling code for your area. As mentioned above codes *67 and #31# work with many cell phones in North America, while 141 works in United Kingdom and Ireland. 2. 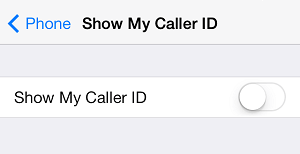 Make a call from your iPhone by prefixing the Caller ID disabling code for your area. For example you will be dialing *67AAA 555-5555 or #31#AAA-555-5555 in case you are trying to call the number AAA-555-5555. In case the Caller ID disabling code works, the person at the other end won’t be able see your Phone number. You need to first make sure that the codes are working on your phone.